A dramatic comedy play written by Alan Bennett under the direction of Nicholas Hyte with music by Richard Sisson. A witty storyline with elements of hilarous comedy to heartfelt touching emotion as a group of young boys prepare to enter the colledge years and chase the last of their youth. A Play written by Alan Bennett, which captures audiences with it's wit and realism. A group of British grammar students with an edge of young angst. Pursuing happiness through the means of most young men, chasing women, playing sports and looking to advance their education together. 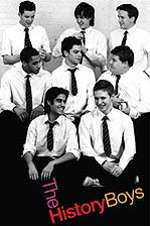 Set in the 1980's the young men known as The History Boys are attending the small grammar school located in the northern area of England. Under preasures to attend a higher education in the better schools such as Oxford they are preparing for the enterance exams. The boys are of course in an impressionable age, and the magic of the show is how the main characters (teachers) influence the learning process, as well as the way they will enter the world. Hector, the english teacher, has a very liberal approach to his teaching. The boys are allowed to learn their own way with little restraint or authority, in which they take full advanteage of through song, acting and even touching into their depper artistic talents with poetry. Hector is not confined to the curiclium of the school program and simply feels the boys should be more free to learn how they choose. This of course cause problems for the headmaster, who is more preasured to see the boys advance their education through the gates of a major school for higher learning. The headmaster moves forward and an hires a History teacher who is more set on exucuting a strict and more guided way of learning to ensure a place at the universities. The battle between Hector and Mr. Irwin (History teacher) teaching styles is presented, as Hector clearly views exams and prepardness to have nothing to do with the learning process. Mr. Irwin is just the opposite, as his educational teaching is based purley on learning the facts of history to pass the exam and gain enterance into a good school. The boys are inbetween two older mens philopshys and approach to life itself, but they flirt with youth and the future simply by enjoying the chase for women and just having an all aroung good time. The History Boy's is a comedic drama with a certain charm which really entertains. The many characters, such as the history teacher himself who has become lost in his profession, produce a sense of idealism, Bennett adds a great touch of humor and surprise with his writing style, and although the ground he is covering is not perhaps new territory for writing in general his approach adds something special to such classic ideas on teaching, youth and of course history. The production is well thought out and delivers a smart and intelligent storyline which really is making an impact on Broadway. The second set is both extremely humerous, as well as an emotional rollercoaster which audiences have been quite vocal about. Loud remarks such as "Remarkable" and "Amazing" are heard as they empty the Broadhurst Theatre. The History Boys is capable of hitting a place in your heart with the charm, youth and intelligence of these rambunctious young men waiting for their place and mark to be made on history itself. Take the N,Q,R,W or 1,2,3,9 to 42nd Street, walk North on Broadway to 44th Street and walk West on 44th Street to the theatre. Take the A,C,E to 42nd Street, walk North on Eighth Avenue to 44th Street and walk East on 44th Street to the theatre.